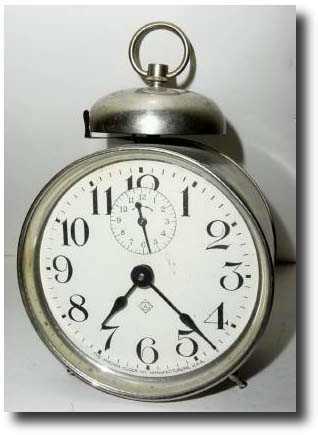 C.1905 Ansonia Clock Co., "Pirate" Alarm Clock (4" Arabic dial). This nickel plated clock is in very nice condition with no signs of rust or corrosion; small ding in case; bell standard slightly bent. The dial is very clean. Ticks alarms; Ly\'s 1998 value $65. Height 5"